The Federal Conventions of 1897 and 1898 were held to draft a Constitution that the delegates would take back to their home colonies to be voted upon. The issue of who 'owns' the Murray was heavily debated. For South Australia, the concern was that users upstream were taking water out of the Murray-Darling system with scant regard for the effect downstream. 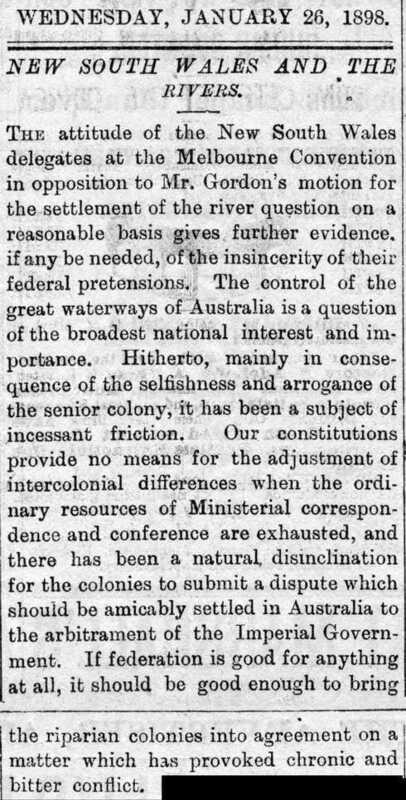 The major fear at this time was that the depleted waters of the Murray were making navigation difficult and disrupting trade vessels, in contrast to today's concerns about water quality and other environmental issues. 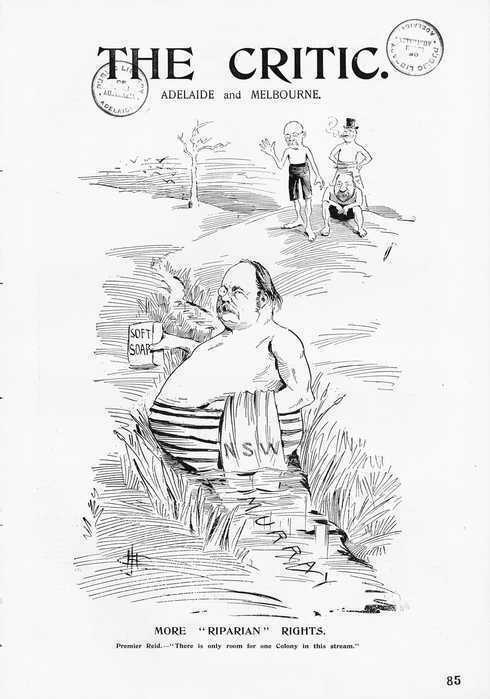 It was thought that Federal control of the country's rivers would enable a national authority to consider the needs of each of the states equally. South Australian delegates who argued strongly the case for national control regarding navigation included Patrick McMahon Glynn, John Hannah Gordon, Josiah Henry Symon and James Henderson Howe. Glynn argued that the Darling should be defined as a navigable river so that, in effect, the navigation of the whole Murray-Darling basin would be protected by federal control. Gordon argued that the Commonwealth government should control all aspects of the Murray-Darling. 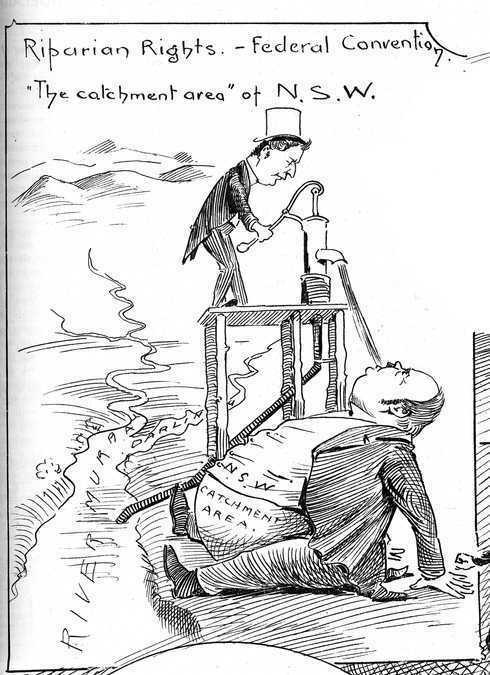 In opposition, however, the Premier of New South Wales, George Reid, moved that any state or individual should not be stopped from utilising river waters for irrigation or conservation. Consequently, the wishes of South Australia were seen to be contrary to those of New South Wales. Some delegates were concerned that if a clause was inserted in the Constitution that was perceived to be against the best interests of New South Wales, voters in that colony would vote against the Constitution as a whole and federation itself would be jeopardised. The Commonwealth shall not, by any law or regulation of trade or commerce, abridge the right of a state or the residents therein to the reasonable use of the waters of rivers for conservation or irrigation. The term 'reasonable use' was deliberately ambiguous and the states continued to argue over this point for many more years.